It gives me no pleasure at all to reveal that, despite coming out in 2003, before Pratchett was tragically diagnosed with early-onset Alzheimer's, The Wee Free Men is far from his best work. For one thing, there is no solidity, personality-wise, to child protagonist Tiffany Aching; sometimes she's incredibly brave and wise, and other times she seems kind of thick, to the point that there's some serious dramatic irony where the reader has to wait for the protagonist to 'catch up' to what's happening and what she should do next. Just about the only consistent characteristic she (or rather, Pratchett) has is an out-of-control predilection for using exclamation marks. Moreover, the Chalk and its inhabitants, while mildly interesting as a setting, presents a number of head-scratchers to the reader: for one thing, Tiffany is so obviously superior to her loser brother, and indeed everyone around her, that the idea she would be ignored or marginalized in favor of the ever annoying bro is nigh impossible to swallow. 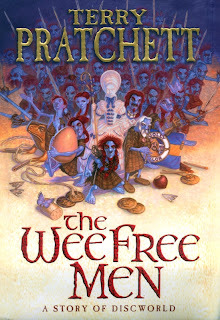 Naturally, being Pratchett, it's not all bad—there are laugh out loud moments aplenty, and even a few poignant ones—but it lacks the dazzle of the more established Discworld character lines (especially the Ankh-Morpork Guards and the Witches of Lancre). The idea of First Sight and Second Thoughts (i.e., seeing what's really there and thinking carefully) is amusing, but it doesn't really constitute Granny Weatherwax-style magic, and unfortunately for Tiffany, that makes Granny a much cooler force around which to shape a story. Perhaps I'm being too hard on Pratchett, however; after all, this book was at least partially intended for a young adult audience, so he probably felt a need to dumb down the jokes, the writing, and everything. As I am sadly no longer a particularly young adult, I kept hoping for a grander edifice, a hilarious mystery of the sort Discworld novels regularly deliver. But what I got, instead, was an attempt by an older sister to rescue her younger brother, not because she likes him, but because he's her younger brother. I like her motivations, but if she's so wise, she should know to pick her battles, and her brother is sooo not worth fighting for! I should probably at least mention the Nac Mac Feegle, the eponymous Wee Free Men. But what is there to say, really? They're just really small Scotsmen (ethnic markers of which show up in such idiosyncratic spelling as 'heid', which fans of Mike Myers' So I Married an Axe Murderer will know just how to pronounce thanks to the uproarious 'Ack, he's got such a 'uge heid!' scene), and so they fight and drink and steal and occasionally get killed and make comments and hide and whatnot, none of which, in the end, is all that interesting. If my disappointment with Pratchett is showing, that itself should also reveal just how highly I esteem many of his other works. In some ways, Pratchett has only himself to blame for this rather negative review: it is he, with classic works like Carpe Jugulum and Going Postal, who has set the bar so high.